Dr Feder studies the evolution of infectious pathogens as they change within their hosts to understand more generally how populations adapt to overcome new and complex challenges. 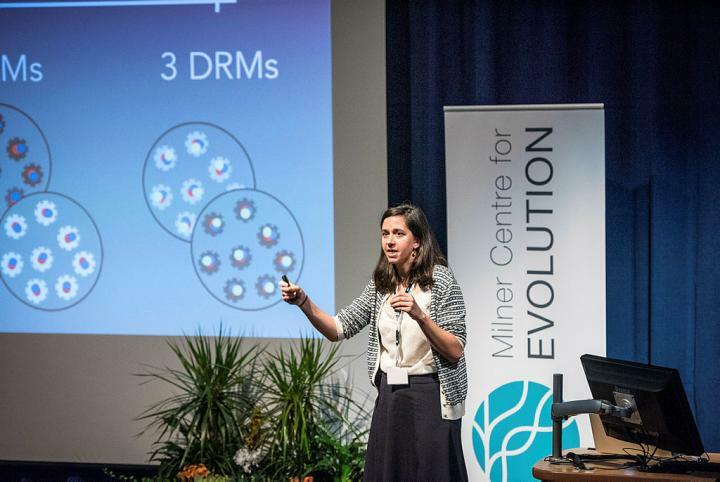 Dr Feder presented her work on Thursday 20 September at the Inaugural Conference of the Milner Centre for Evolution: Evolution in the 21st Century. She talked about how HIV's high mutation rates and large population sizes makes it incredibly adaptable, especially to the drugs used in its treatment. The lecture explored how drug resistance evolution has changed over the course of the epidemic and the role population spatial structure plays in influencing intra patient dynamics. More broadly, the talk addressed how studying evolution and disease jointly can improve our understanding of them both. She received her prize from Dr Jonathan Milner, alumnus of the University of Bath and educational philanthropist whose donation helped establish the Milner Centre for Evolution. "I'm deeply honored to have been invited to give the inaugural Milner Prize lecture. Both the conference attendees and the members of the Milner Centre are such an impressive and inspiring group of scientists that the opportunity to present my work is really something very special." "The committee were very impressed by Alison's research. Not only is it cutting-edge, but her work tackles both deep theoretical problems that have immediate relevance, to understanding how viruses like HIV adapt to drugs, thus tackling evolutionary biology closer to the clinic. We were delighted to be in a position to award the inaugural Milner Prize Lecture to such an outstanding candidate." "I was exceptionally fortunate that Alison Feder chose my lab for her Ph.D. She is an extraordinary young scientist with exceptional creativity, originality, focus, range of skills, and the sense of how to identify and then answer truly deep questions in evolution and evolutionary medicine. "She is just at the beginning of what I am sure will be a brilliant career and I find it very fitting that she is the keynote speaker for the inaugural meeting of the Milner Centre for Evolution. It also makes me very proud."